The name garnet applies to a group of aluminium silicate minerals that differ mainly in the substitution of one mineral element in their compositions. All garnets have a hardness of 7 – 7.5 and are isometric in their crystalline structure. Garnet crystals can occur in the form of dodecahedrons or trapezohedrons. 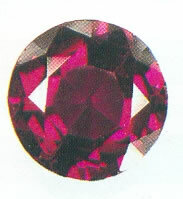 Pyrope garnet, which is an intense red, sometimes available with shades of orange or brown. Almandine garnet is deep red with violet tints. These stones are usually cut as cabochons. Hessonite (also called Grossular) Garnet occurs in a very wide range of colors. The most common color is orange-brown color is due to manganese and iron inclusions. If you are in a time of change or anxiety and excited feeling, garnets can provide a sense of rootedness which helps you focus practically. It also gives a sense of expanding strength in your capacity to reach the goal. The required applications between these garnets differ from person to person and the vibration rate of the required core numbers.